Yves Rocher is France's no. 1 selling make-up and skincare brand, and it is sold in 88 countries worldwide, being used by 30 million women every day. The brand's speciality is providing affordable, all-natural beauty products that use specially-grown botanical properties. I have used the brand before, but many moons ago! When I was approached to try four products from the range, I jumped at the chance. And I couldn't be happier than with what was sent. KIKO MILANO are a cosmetics brand that I have heard tons of other beauty bloggers rave about for months. The store reminded me of a club, all flashing multicolour lights, and loud music. I perused the packed (to the rafters) stands and chose two items, one of which was this mascara. A New Year and a fresh beauty box from the team at My Little Box. The January 2015 offering (as I had feared) is a fitness themed box! Yes, yes I know its a new year and everything, but does every box HAVE to be about fitness?? What if your like me, and a couch potato that prefers "sitting" than doing much else? Well this months offering came, and although beautifully packaged as always - it was tinged with HUGE disappointment from me. Loving all things hair like I do, being sent hair tools or products to review fills me with joy. Look Fantastic kindly sent me The "Wet" Brush - a company and concept that I had never heard of before. I adore my Tangle Teezer, so anything which can sway me from my beloved collection of Tangle Teezers (I have quite a few) must be good, right? So The "Wet" Brush was welcomed with open arms into my hair arsenal, and it's definitely here to stay. I can now explain why I love it so much, after over a month of using it. When new products arrive on my desk I kinda jump up and down and get excited! After all isn't that what blogging is all about? Finding new ranges and trialling them? #LipGlam is a new concept in the world of multi-purpose moisturisers, want to hear more?.. 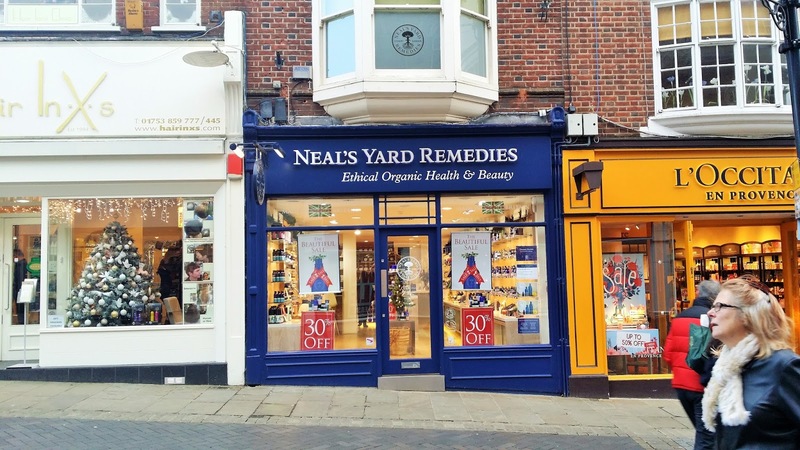 Just after Christmas I was lucky enough to be asked to visit the Neals Yard Remedies store in Windsor. This was in celebration of the Windsor store turning one on the 18th. Unfortunately due to work I couldn't attend the 18th December celebrations, but the team at Neals Yard offered me a treatment at another time,and to pop along to the store anyway, which was lovely! I haven't been to Windsor for years, so it was a day out for me, with some major history thrown in for good measure.